When you hire Mission Valley Towing to tow your car or truck, you will be greeted with a 2015 Hino flatbed rollback tow truck. Equiped with a superior load angle and the newest and latest flatbed towing techniques, you can be assured of getting the best available. Flatbed towing with Mission Valley Towing has the better load angle than our compeditors using a similar truck. Mission Valley Towing has the truck outfitted back in Ohio as a custom built flatbed. The flatbed isn’t built until the company in Ohio receives the truck. The answer is a flatbed tow truck with a load angle 2 to 3 degrees better than what’s available in southern California. Mission Valley offers the flatter incline on flatbed towing and that always helps. This becomes more important when a cable is pulling from underneath your car. 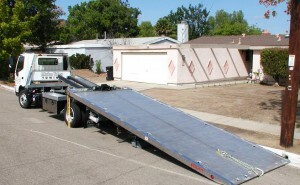 When you hire Mission Valley Towing to flatbed your car, beyond having the best angles and a 2015 truck, your driver will have over 20 years experience flatbeding cars.If your car has been lowered or your car has low clearance, or you just want the best for your car, this is the flatbed for you. Were going the extra distance to have the best for our flatbed towing customers. We go the extra distance to have the best for our flatbed towing customers. 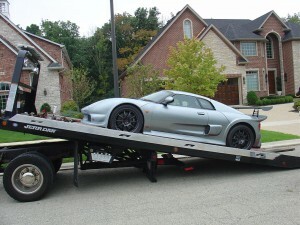 Mission Valley Towing can offer the 8 point tie down for flatbed towing. This type of hookup requires 2 tie down points on a flatbed for each tire. This hookup requires a strap around each tire. The strap in ratcheted tight and secured in 2 places for each tire. This might not be the suggested towing method for every car, but, for some cars this is essential. Were going the extra distance to have the best for our flatbed towing customers. Mission Valley Towing has been flatbeding cars in San Diego since 1992. We continue to have the A plus letter grade from the Better Business Bureau and to this point in time, I have never seen a negative review from any of our customers. You as a customer will be greeted with a friendly and professional flatbed towing operator with over 20 years experience. We’re going the extra distance to have the best for our flatbed towing customers. Calling in Mission Valley Towing for a Flatbed Towing Service in San Diego will be the best decision you will make for your automobile. Our technicians will show up in a modern, well-equipped Hino flatbed rollback tow truck. Our representatives are perfectly trained to operate the machinery and provide you with a seamless flatbed towing service. What makes us different from our competitors is the fact that we don’t just operate with stock flatbed trucks. We have our trucks modified in Ohio, which means they have a customized flatbed and they offer a better load angle than any other flatbed towing truck out there. The difference of only 2-3 degrees can be huge when it comes to the loading and unloading of certain types of vehicles. Our custom fitted flatbed trucks offer flatter incline, which is beneficial when your car is being pulled on the truck with the help of cables underneath. Cars that been lowered are at risk of being damaged if they are pulled on to traditional flatbed trucks, but with our customization, that risk evaporates. The unique technology is not the only advantage that Mission Valley Towing can offer its clients. Our technicians have decades of experience with operations of flatbed towing, and they all the complexities of loading all types of cars onto a flatbed. Their experience ensures that they are prepared to handle any situations that they may arise during a towing. Going The Extra Mile For Our Customers Is A Norm For Us! The most important part of flatbed towing is securing the car properly to transport it from point A to point B. Mission Valley Towing offers an advantage in this aspect as well. The 8 point tie down that we utilize will require 8 tie down points for each tire of the car, although, we don’t use the same tie down method for every car that we transport on our flatbed trucks. The different tie down methods is just one of the ways that we go above and beyond for our customers. We have been in the Flatbed business for a while, well over 2 decades, and our experience and expertise have allowed us to deliver a high standard of flatbed towing service in San Diego. We have received an ‘A Plus’ grading from Better Business Bureau, only because we have been able to deliver premium quality services to our customers. The quality service starts with an introduction to Mission Valley Towing through a friendly representative over the phone, so make the call now and see how we can help you in the transportation of your vehicles.